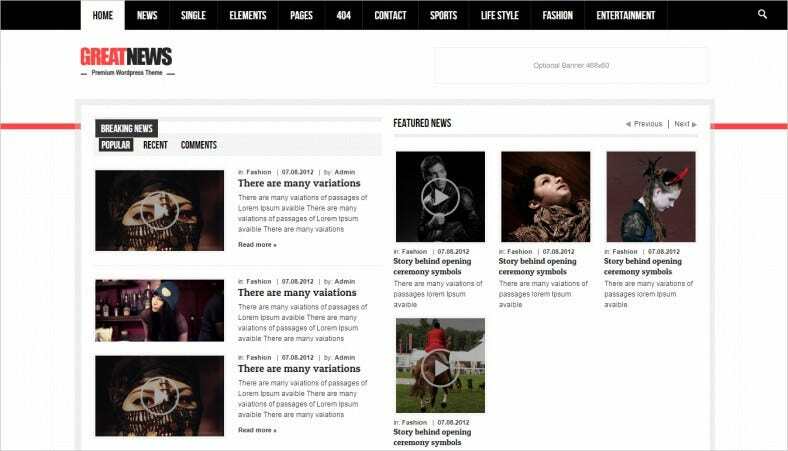 If you keep yourself up to date with the latest trends and technologies, you would see that e-zines are the latest in things now. An e-zine is basically an online magazine. Not many people would actually go to the trouble of reading a magazine in the present generation. They would rather log on to their favorite websites online and read all the latest trends related to fashion and lifestyle or entertainment online. 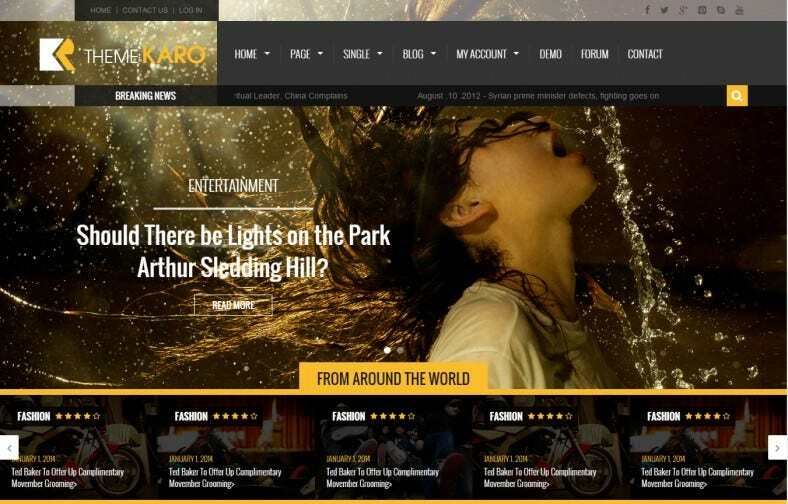 If you’ve decided to start an online magazine of your own, you cannot afford to miss out on this marvelous collection.You may also check Writer HTML5 Themes. 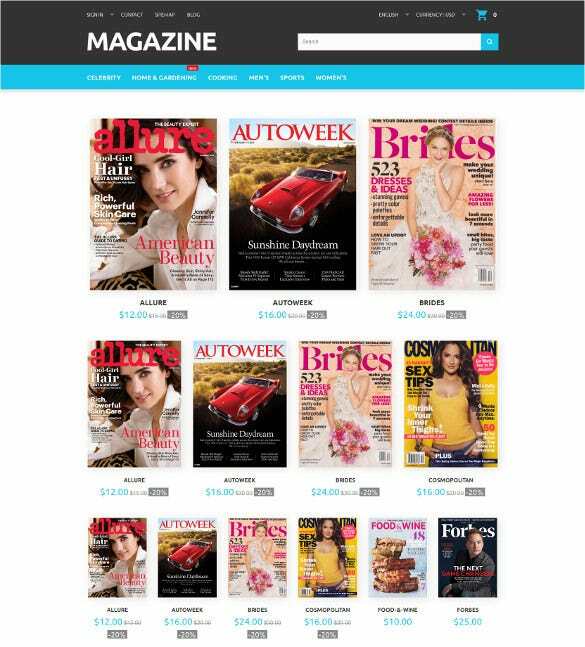 Search engine friendly, which is a very important quality in online magazines. Contains both admin panel and gallery. If you’re starting a magazine for something as important as news, you can take the help of this template. It has a professional touch and looks formal. That makes it compatible with news magazines. 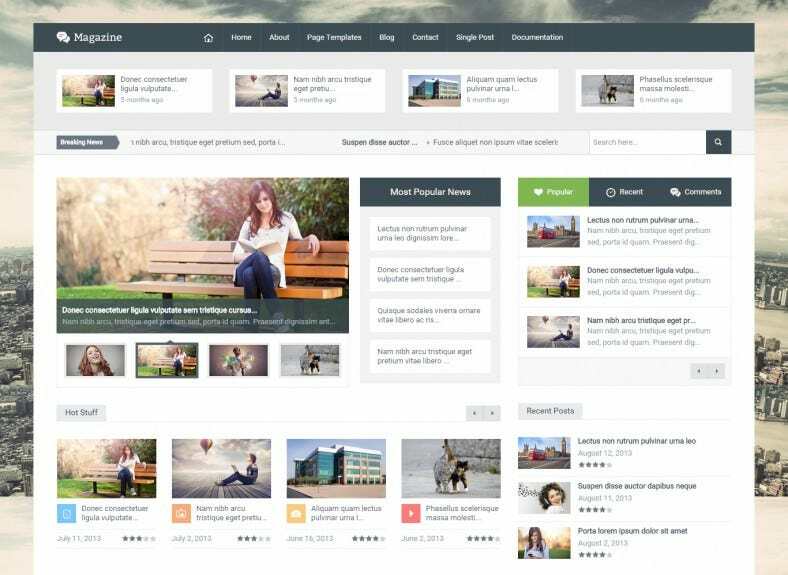 You will be able to organize all your content, along with your images, in the manner you please on the magazine template. So come on, give it a try. Magento is an online platform which is known for having some of the best themes online. 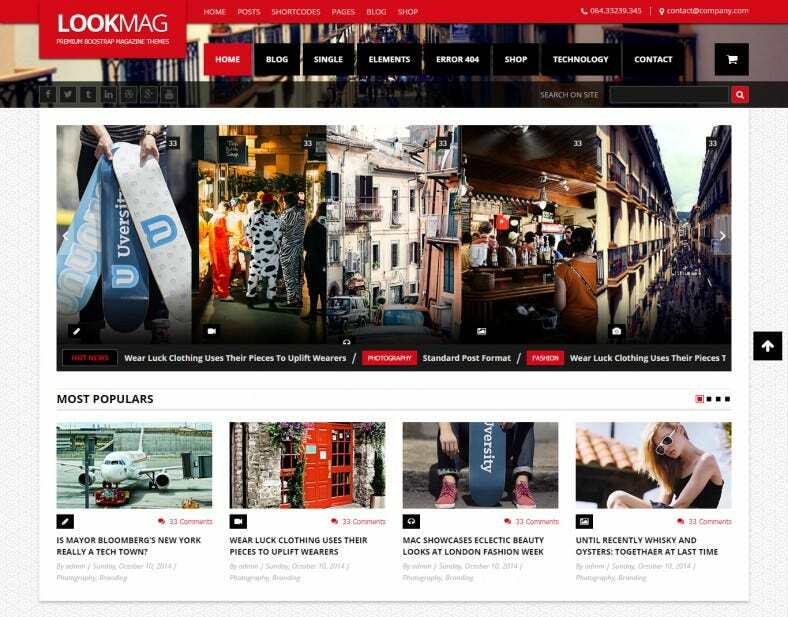 Naturally, this magazine theme template has been designed in a stylish manner by some of the best professionals. The color scheme is interesting and that makes it look all the more attractive. If you’re starting a fashion magazine, you should take a look at this template. Some people prefer to buy and read their magazines online. For them, you should have a gallery of all the magazines you have so that customers can choose. 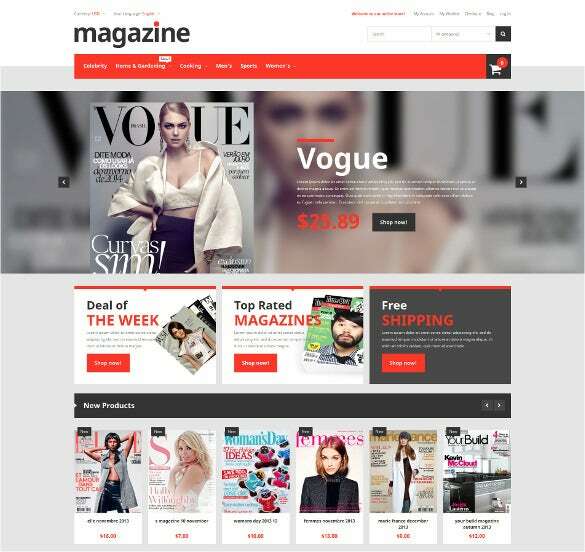 To do that, you can take the help of this magazine store template. It focuses on just the magazines, and the minimalistic design makes it look really impressive. A magazine is nothing if not elegant. 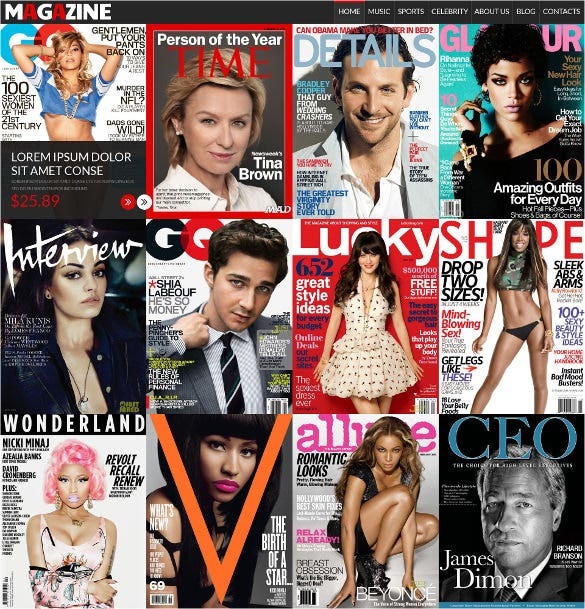 You should always go for a sophisticated and elegant design when it comes to the outline of your magazine. You want people to like you magazine, don’t you? Then you should opt for this template. The quirky background of the template certainly contributes a kind of charm to the magazine as a whole. 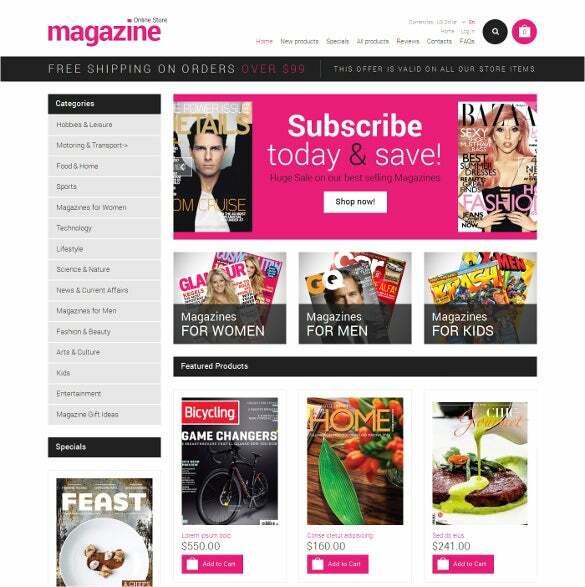 If you’re looking for free magazine templates, then it certainly doesn’t get better than this. However, this template would be more appropriate if you’re starting a news oriented website. That’s because it has a professional touch and appears smart yet stylish. 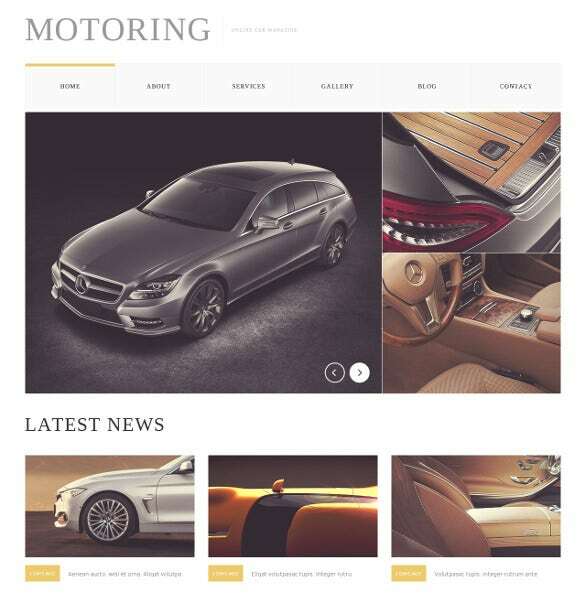 The overall look of the template has been kept formal to suit your requirements. If you love reading interesting materials and content online, you could use this template. It contains a bright and colorful background which makes it look all the more attractive. 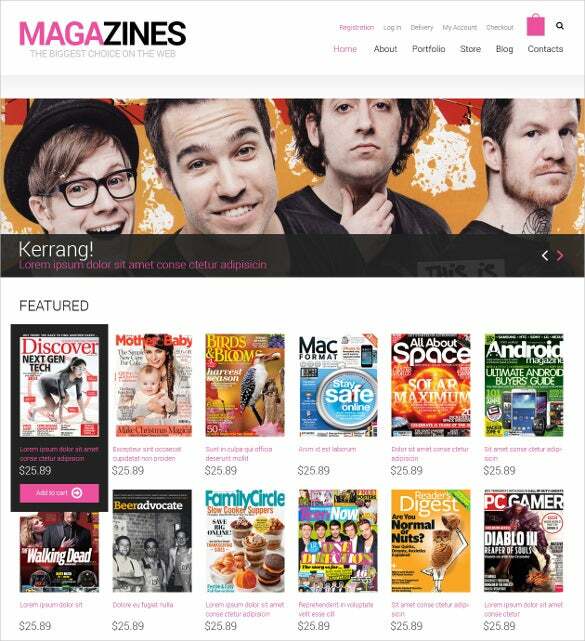 The dark background certainly highlights the main content of your magazine. Naturally, this template is a popular choice for even some top magazines. The colorful background is the first thing you notice about the template. 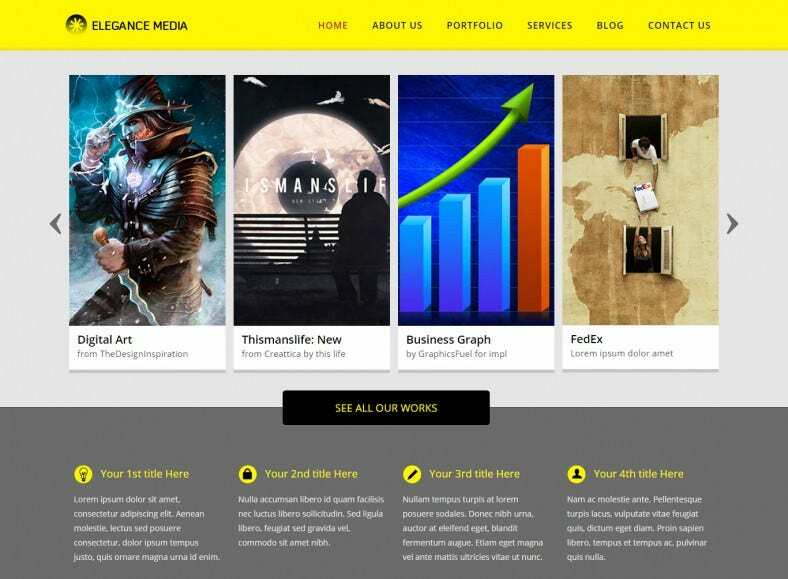 The next thing you notice is the professional look that is consistent throughout the template. Plus, if you’re starting a news website then this is the template for you. 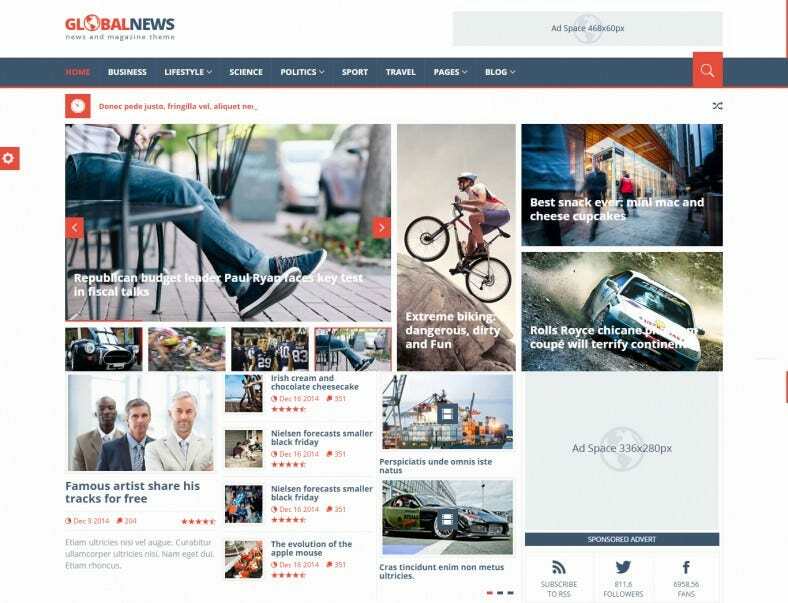 You can update any kind of news you want here each day, including world news, lifestyle or even the showbiz world. Are you a car or bike fanatic? Then you probably want to reach out to others with the same interest as you. And what better way to do that than a magazine? To do that, you would be needing a special themed template. And that’s why, this template has been professionally designed keeping the needs of the magazine in mind. It would be the perfect way to amp up your magazine and make it appear really stylish. This particular template has been kept relatively simple and to the point. 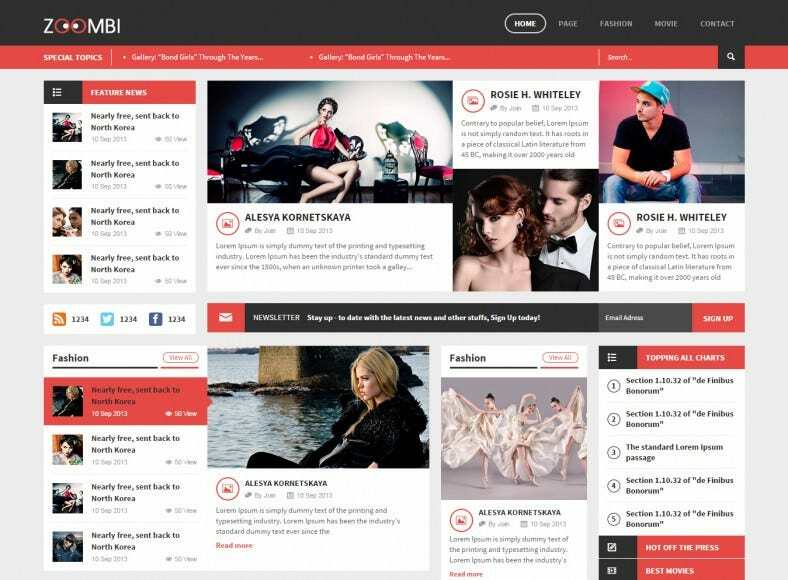 It is well designed and has a responsive layout. Also, the interface has been kept simple and clutter free. That makes it even more popular. After all, a magazine has to be neat and tidy. 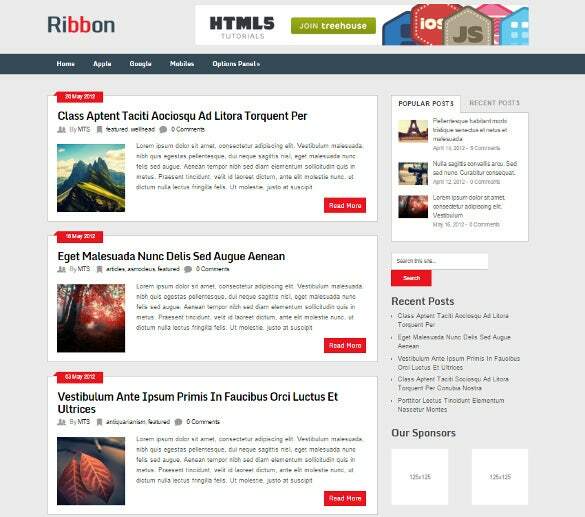 Most importantly, the template can be used as a magazine, a newspaper and even as a blog! 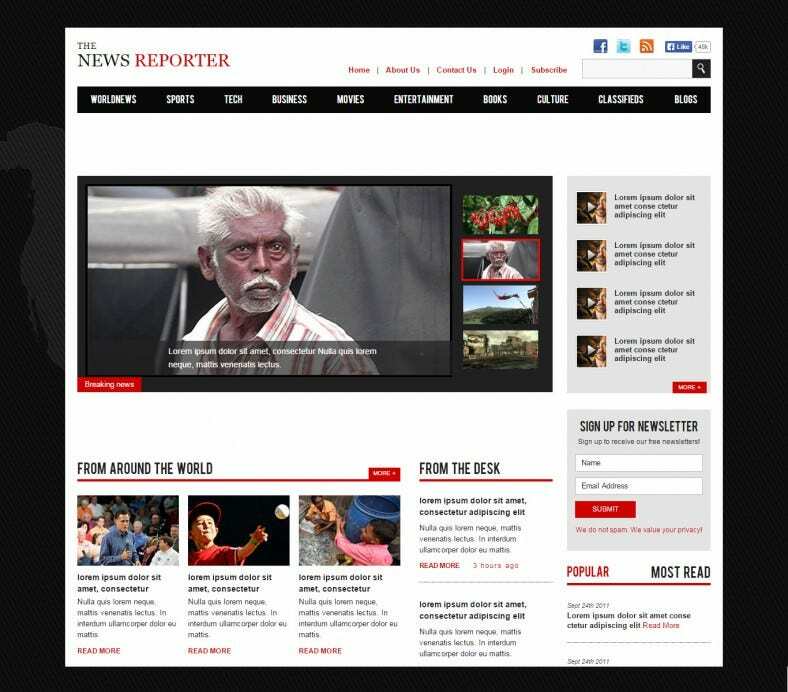 Are you a reporter who has just started an independent website? Then you must take a look at this template. Not only does it look fantastic, but also appears to be professional in appearance. Just what a reporter should be! 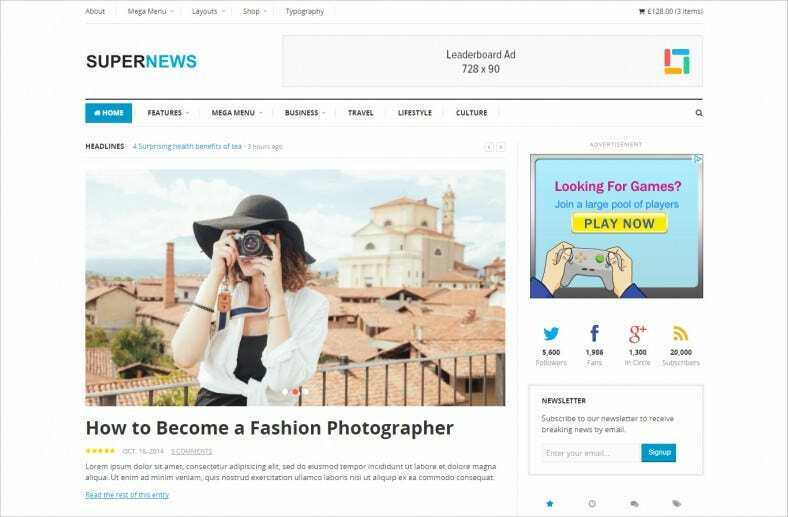 You can publish relevant articles about the news items and even update them on a daily basis, since it is really easy to edit and customize. A magazine is nothing if not shiny! It should be glossy and glamorous. These are the first things that come to your mind the moment you think magazine, isn’t it? If that’s what you’ve been looking for, then this is the template for you. 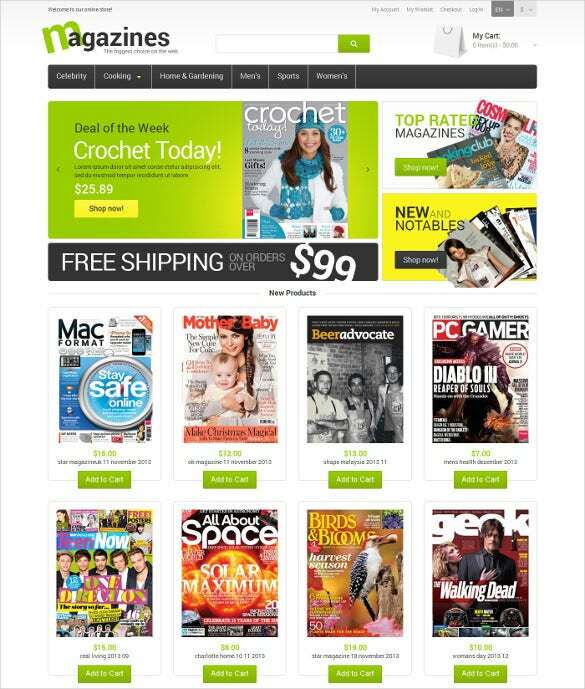 The lime green theme certainly adds a different charm to the magazine templates. This is an unconventional template and it would definitely help your magazine stand apart from the others. As the name suggests, this magazine template would be more suitable for magazines that deal with serious topics like current events. If you’re creating such a magazine, then you shouldn’t waste anymore time and just download this template. It is easy to edit and customize and that means, you’ll be able to update it whenever you want to, even daily! 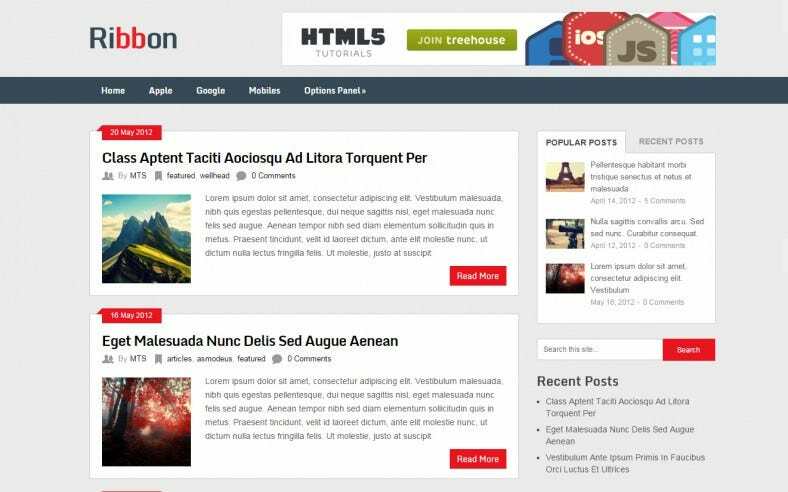 With this theme template, you get to add a featured image to your news articles or blog posts as well. If you manage to get attractive and impressive images, you’re surely going to be attracting more visitors. 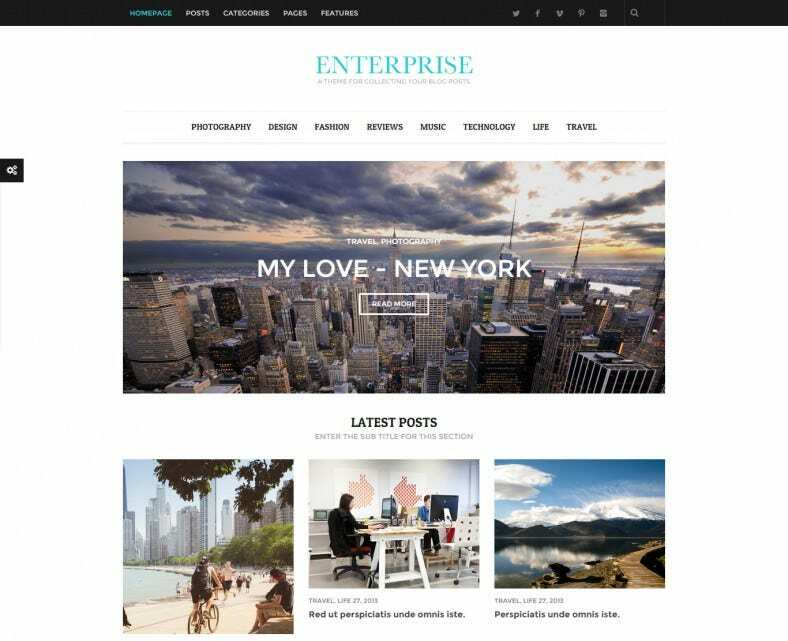 The best part about this template is that it is so versatile – it can be used as a blog or as a magazine! How wonderful is that?! WooCommerce is another popular platform that contains a wide variety of themes and templates. This particular theme exactly resembles the format of a magazine. It looks stylish with a white background adorning the template. That way, the attention of the readers isn’t distracted from the most important item- the magazine content, of course! So come on, give it a try!